In November 2017, the Global Forum on Agricultural Research and Innovation (GFAR) convened a training course and a Symposium on Farmers’ Access to Data in Centurion, South Africa. The events were co-funded by GODAN and CTA and were organized by ITOCA. video recordings of the symposium here ! summary of the training course held in the days before the symposium on the same topics. series of webinars we’re producing to make the content of the training available to everybody ! 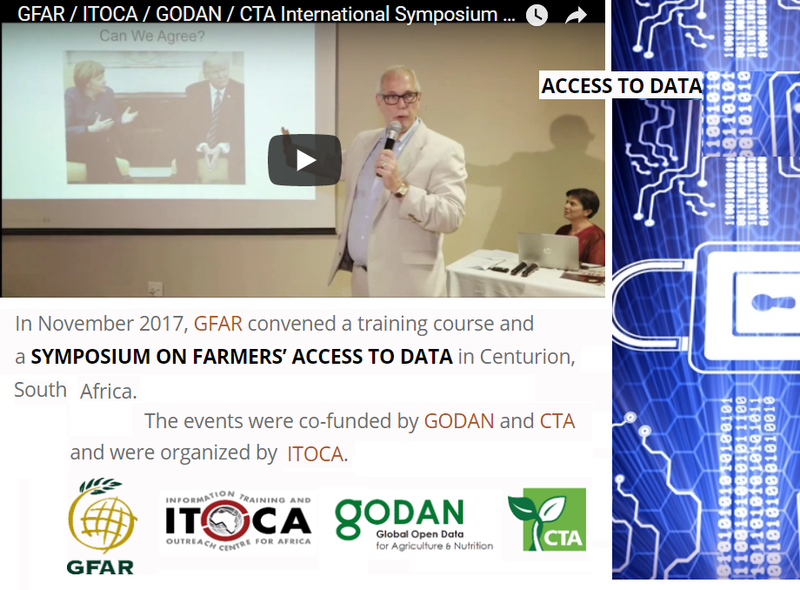 As an outcome of the symposium, the panel chairs and the trainers in the course that took place in the preceding days have written together a white paper on “Digital and data-driven agriculture – Enhancing Use of Data by Smallholders” that will be soon co-published by GFAR, GODAN and CTA. Stay tuned for the announcement ! Recorded GFSR Webinar on "Data-Driven Agriculture : an overview"